Are you the Master or are you enslaved? Is something possessing you? Or are you possessing something? 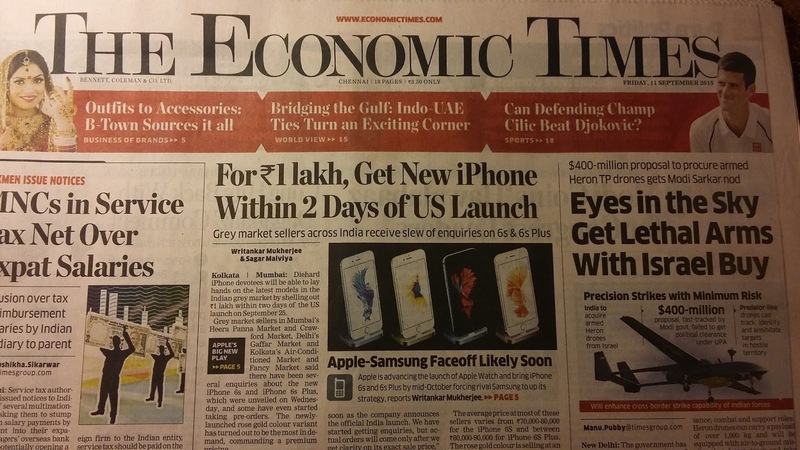 I saw a lead story in The Economic Times last week saying the iPhone 6S which launches in the US on September 25 will be available in the Indian grey market for Rs.1 Lakh – instantaneously. When I read the story, I could not help but reflect on the way some people look at Life. (Disclosure: I have never owned an iPhone. Ever since the iPhone launched I have been unable to afford one. My current phone is a basic Samsung smartphone that my friend has helped me acquire.) The fact that grey market entrepreneurs in India are seeing a business opportunity here is evidence that there are people who want to have that phone now. But I wonder why people can’t wait for an official India launch – after all isn’t India a big market for all ranges of phones? Perhaps, allowing logistical and regulatory delays, the iPhone 6S may well be available here by year-end. I am not even talking about the monetary price that people are willing to pay, I guess there is a spiritual perspective, a heavier price that people have to pay actually, to consider here – in reality, isn’t the iPhone 6S possessing these people while it only appears that they are rushing to possess the phone? The iPhone 6S is but a metaphor. All of us are possessed, in fact enslaved, by our thoughts, by things we have bought and by opinions that we have cultivated. In our trying to build an identity for ourselves, what we have started to focus on is what we want to possess; in wanting more of such possessions we are missing the point that the possession has begun to possess us! And what possesses us goes beyond the material realm. I have a friend who believes that the world must go on appreciating his work – he is world-famous and a legend in his field. But he craves for validation and public appreciation – constantly. When he or his work doesn’t get noticed or talked about, he feels miserable. Now, who’s possessing whom – does my friend possess the attention he gets or does the attention that he doesn’t get possess him? There’s nothing wrong in seeking attention if you can get it or buying what you want if you can afford it. But to become obsessed with what you want will leave you suffering when you don’t get what you want. It’s a simple truth that you miss – if you own something, you are its Master. If something owns you, it is the Master. How many Masters do you have? Review your Life – from a ruinous habit to your car to an opinion to your thoughts to a parent to a spouse, anything or anyone can be controlling you. Even if you have one thing or person controlling you, you are living enslaved. To be free, you must stop wanting, stop obsessing. You must let go and simply learn to be happy with whatever you get and whatever there is. Author AVIS ViswanathanPosted on September 15, 2015 March 14, 2016 Categories Apple, Art of Living, Happiness, http://schemas.google.com/blogger/2008/kind#post, Inner Peace, Intelligent Living, iPhone, iPhone 6S, Master, Possession, Samsung, The Economic TimesLeave a comment on Are you the Master or are you enslaved?